On the last full weekend of every month, the San Francisco Bay Area's Treasure Island becomes home to one of the hottest indie craft and antique fairs around, complete with live music, endless shopping, and more than two-dozen food purveyors — from Bay Area favorites to underground start-ups. Here's your guide to scoring the most from TreasureFest's multitude of riches. The San Francisco Bay Area's Treasure Island Flea Market (or “TreasureFest,” as it's now known) got its start in 2011, inspired by the nearby, long-running Alameda Point Antiques Faire on Alameda Island. From the beginning TreasureFest's organizers always intended it to be a lighthearted monthly event, with some antiques and vintage wares but also with a fresh artistic slant. In 2016, the market moved from Treasure Island's east side to its west, offering prime views of the San Francisco-Oakland Bay Bridge's stunning new eastern span. TreasureFest has grown exponentially over the years and now sports a vibe that's more in tune with an indie craft fair than a showcase for antiques and collectibles — though you can still find such vendors at the fair. 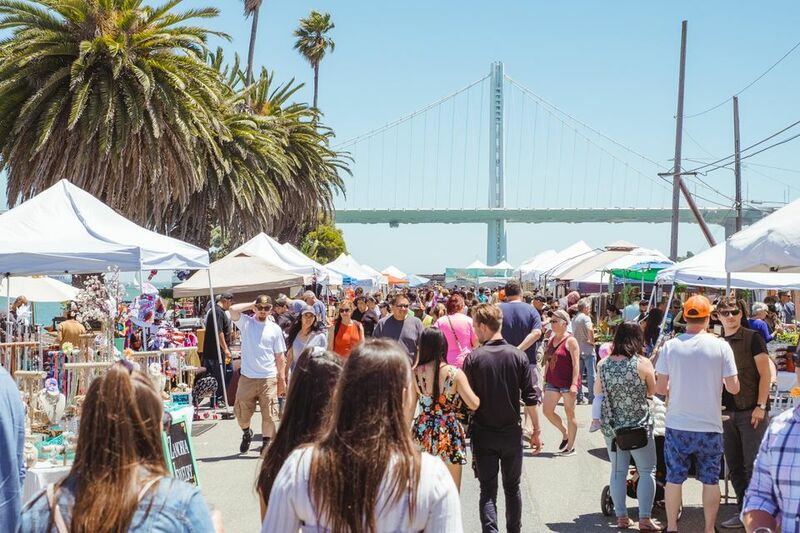 Today the event is home to a rotating array of 400+ vendors, lining the waterfront on both sides of a long promenade selling everything from up-cycled handbags and handmade necklaces to vintage shirts and limited-edition illustrated prints. A plethora of food trucks and tents, as well as live music, are also the norm at this bustling open-air extravaganza—which features DIY workshops and plenty of alcohol as well. To get the most out of TreasureFest, here are some things to keep in mind. On-leash dogs are welcome, though the event can get crowded so make sure your pooch is good with crowds. There are tables and lawn chairs for shopping breaks, chowing down, and listening to live tunes, but these can fill up fast. Bring along a picnic blanket and you've got a perennial place to chill. TreasureFest's organizers say they have so many vendors that their line-up changes monthly, so if you want that wall piece made from recycled skateboards make sure to grab a business card. Many of the markets are also themed, depending on the month. For example, the 2017 holiday market (which took place in November) included free snapshots with Santa and 20 tons of snow. There are typically around 35-40 food vendors each month, set up in a cul de sac-style section at one end of the shopping corridor. Popular Bay Area purveyors such as Bacon Bacon and Chairman Bao — known for their filled baked and steamed buns — share space with up-and-comers, and there are also three bar tents serving up beer, wine and seasonal cocktails. Some favorite foods include Hula Truck's Pacific Island-inspired creations and Humphry Slocombe's innovative ice cream flavors. A kids area includes games like Giant Jenga and chalk stations. TreasureFest takes place on the last full weekend of the month February-November, from 10 a.m. until 4 p.m. Admission costs $4 per person if purchased online, or $7 at the gate. Kids under 12 are free. It so happens that Treasure Island is a hub for urban wineries, with approximately 6 wineries and tasting rooms — many which are housed in repurposed military facilities from when the manmade island served as a U.S. military naval station. Popular spots include Sottomarino Winery, specializing in Old World-style wines, boasting its own bocce ball court and picnic area, and offering unique tasting in what was once a submarine-like military training vessel; and the island's original winery, Treasure Island Wines, opened in 2007. History buffs will enjoy a visit to the non-profit Treasure Island Museum, which showcases the island's years since its 1930s manmade beginnings as a site for the Golden Gate International Exposition — a World's Fair celebrating the openings of San Francisco's two new bridges. The Treasure Island Sailing Center on the island's south side features both kayak and stand-up paddle board rentals, perfect for exploring the waters of Clipper Cove and featuring spectacular views of the San Francisco-Oakland Bay Bridge above. Restrooms are located at each TreasureFest entry and cleaned throughout the day. There's also plenty of free parking close to the entrance, though arrive early for the best spots. Treasure Island sits midway along the San Francisco-Oakland Bay Bridge in the middle of SF Bay, and is accessible by car in each direction. Once on the island, take a right on California Avenue and follow the signs. Travelers coming from the East Bay incur a $6 bridge fee. There aren't any gas stations on Treasure Island, so fill up beforehand. From downtown San Francisco, the Muni 25 bus makes it way around the island. It's about a 10-minute ride from SF to TreasureFest. Bicyclists from the East Bay can take the Bay Bridge Zuckerman Bicycle/Pedestrian Path to the Yerba Buena Island Vista Point, and from here follow a path along YBI's Hillcrest Road to the connecting Treasure Island.